As you go into the house from the garage these canbinets were installed in the niche there. When they were installed I first primed them then put several coats of a deep wine color as a base. 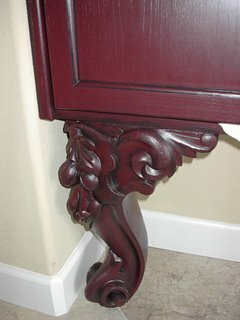 Then I took black and rubbed it into the creases and crevices. 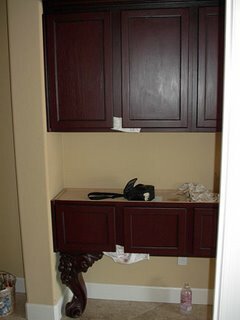 The cabinets are not quite as dark as the first photo but certainly darker than the other two. Its just that with the flash on it changes the color somewhat. 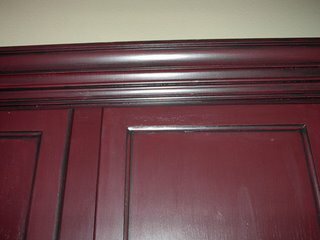 I love creating this hand rubbed look for the cabinets, it just seems to create a really rich look. Check out those legs in the last photo.